We built some code in PHP that performs most if the 3.x admin console functions. Now with 5.x there appears to be RESTful services to do the same. Does anyone have code examples they are willing to share that uses RESTful services to add users, add roles, add solutions, add datasources? Change the same, assign roles, deletes the same? I think it is an interesting question. I haven't seen many people integrating Pentaho in their PHP web applications so I decided to do a quick write up to demonstrate that this is not only possible but actually quite easy. Pentaho 5.x featured major refactoring to modernize its webservices to be more RESTful. Here's an overview of all the services. All these webservices reside under the /api path beneath the path of the Pentaho web application, which is by default in the /pentaho path at the root of the server. Each service has a distinct path beneath the /api path. So assuming the pentaho server is running on the localhost (at the default port of 8080), you can access all calls offered by a particular service beneath http://localhost:8080/pentaho/api/service-specific-path. In general, with very few exceptions, Pentho's web services use either GET (to retrieve information) or PUT (to modify or change data). There are a few calls that use POST (for example, the publish service). As far as I know, DELETE is not used. If a service accepts parameters, they are either passed through the query string or as a document in the request message body. This is colloquially known as the POST data, regardless of whether the POST method is actually used. As per the design of the HTTP protocol, GET calls only accept parameters via the query string. The PUT calls to the Pentaho webservices sometimes accept parameters via the query string. This happens only if the information passed in the parameter has a relatively simple structure - think of a single key/value pair, or maybe a list of values. More complicated data is typically conveyed via the message body. In general Pentaho's web services support both XML and JSON. You can control the data format of the response by specifying the Accept request header. To specify the format of the request message body, you should use the Content-Type header in the request. Unfortunately the documentation does not have any human readable descriptive information, so sometimes a little inspection and experimentation is required to figure out exactly how things work. For this write-up, I decided to focus on the administrative interface around users, roles and privileges. NOTE: The link above only lists the web services that are built into the Pentaho Business Analytics Platform. The platform can, and ususally does, have multiple plugins that offer extra functionality and some of these plugins ship by default with the server so that one might consider those also as builtins. Each plugin can, and often does, offer its own service calls, but these are not listed in the documentation referred to above. A discussion of these is also out of scope for this write-up but I will try and get back on this topic in a future blog post. If you don't feel like waiting that long, you can try and figure out the webservice calls offered by a particular plugin by doing an OPTIONS request to the root path corresponding to a particular plugin. 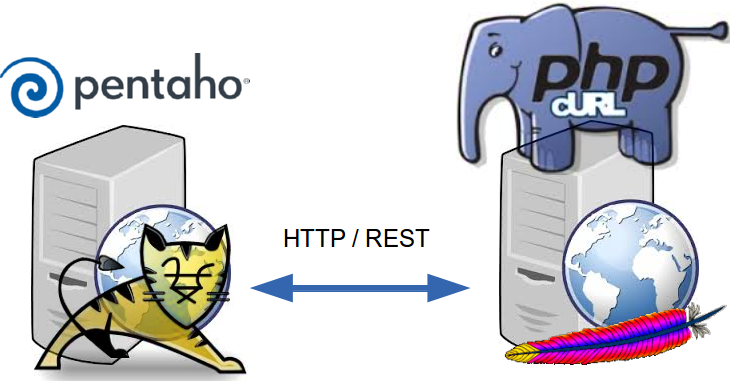 The root path of a particular plugin is http://localhost:8080/pentaho/plugin/plugin-id/api. You can obtain a list of all installed plugins by doing a GET request the ids service of the PluginManagerResource services. I found the following tools to be very useful in inspecting and experimenting with the Pentaho webservices api. 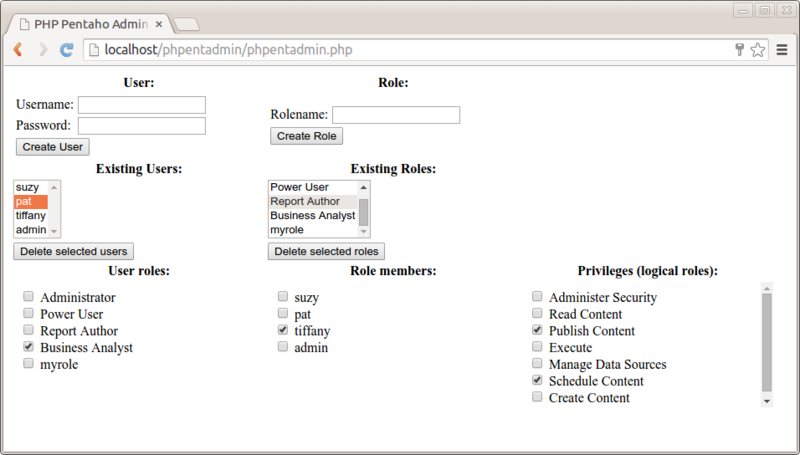 Administration perspective in the Pentaho user console. This web application ships with Pentaho and is normally used by Pentaho administrators to manage users, roles and privileges. Basically, we want to offer the functionality provided by this web application, but then with PHP. The network tab in google chrome's developer tools. I used the network tab to monitor calls from Pentaho's administration perspective to the services provided by the Pentaho server. Postman REST client. This is a handy extension from the chrome webstore. It allows you to do all kinds of REST calls directly from within your chrome browser. This was useful to test any assumptions on the details of how to exactly construct requests to the Pentaho web services. All functionality to work with users, roles and privileges is bundled in the UserRoleDaoResource service. The services specific path of this service is /userroledao. So, all calls that belong to the UserRoleDaoResource service can be accessed through the path http://localhost:8080/pentaho/api/userroledao. Retrieve the list of existing Pentaho user accounts. Create a new Pentaho user account. Modify the password of the specified user. Remove one or more Pentaho user accounts. Roles are basically a package of privileges (system roles), which can be assigned to one or more users. Any given user can be assigned multiple roles. Retrieve the list of existing roles. Create a new role. After the role is created, privileges can be assigned to it, and the role can then be assigned to one or more users, effectively granting the associated privileges to those users. Remove one or more roles. Assign all available roles to the specified user. Assign the specified role to all available users. Assign a specific role to a particular user. Unassign whatever roles were assigned to a specific user. Take the specified role away from all users that were assigned the role. Unassign a specific role from a particular user. These are essentially privileges: the ability to perform a particular action. Examples of such actions are Read BI content, Publish BI content, Schedule a job etc. In Pentaho, system roles cannot be assigned directly to users; instead, they have to be assigned to a role. Roles can then be associated to users to effectively grant them the privileges associated with the role. This returns a document containing two separate bits of information: the list of available system roles, as well as the association between regular roles and system roles. Specify which system roles are associated with a particular regular role. Note that there is no separate call to add or remove individual associations between a role and a system role: rather, an entire set of system roles is assigned to a role at once, removing whatever set was assigned prior to that role. Remember, you can always obtain the entire set of calls available for the UserRoleDaoResource service for your server by doing a OPTIONS request at the root of the /pentaho/api/userroledao path. Typically, calling out to HTTP (or FTP) servers from within PHP is done using the cURL library. A full discussion of cURL in PHP is well out of scope; you can refer to the - excellent - official PHP documentation instead. I will only discuss the basic pattern and only in as far as it applies to calling the Pentaho webservices. Obtain a cURL handle by calling curl_init(). You should save the handle to a variable so you can use it in subsequent calls to the cURL library. Configure the cURL request by doing various calls to curl_setopt($handle, $option, $value). Each curl_setopt call basically sets a property ("option") on the cURL handle that is passed as first argument to curl_setopt(). The library defines a large number of property keys to control the various aspects of the HTTP request, such as the HTTP method, the request headers, message body etcetera. Call curl_exec() to send the request. This function will also return the response if a prior call to curl_setopt($handle, CURLOPT_RETURNTRANSFER, TRUE) was made. Finally, curl_close($handle) should be called to clean up the cURL handle and free any underlying resources used by the library. As you can see the snippet follows the general cURL calling sequence. The options CURLOPT_URL and CURLOPT_CUSTOMREQUEST are used to specify the url and the HTTP method respectively, and CURLOPT_RETURNTRANSFER is set to TRUE to obtain the response as a string result when calling curl_exec. The CURLOPT_USERPWD option is used to specify the credentials for basic HTTP authentication. The value is a string consisting of the username and password, separated by a colon, and the example uses the default built-in administrator's account called admin with the password password. Note: The web service requests described in this blog post require authentication with the admin account, or at least an account that is privileged to perform administrative actions. Other webservices my work while being authenticated with less privileged accounts. No specific request headers were set in this example. Because there is no specific Accept header to specify a format for the response, the default format will be used, which happens to be XML. Note that all request headers must be passed as an array of strings using a single call to curl_setopt($handle, CURLOPT_HTTP_HEADER, $array_of_header). Each element of the array of headers should be a single string, consisting of the header name followed by a colon followed by the header value. While the format for the response defaults to XML, it is generally a good idea to always explicitly specify it. In order to explicitly request for XML, change the value for the Accept header to application/xml. Fortunately, for this particular task, the XML documents are always simple and never very large, and I have had good results working with the SimpleXML library. I believe this is included and enabled by default, which makes it a safe choice. Another reason why I like SimpleXML is that it offers exceptionally convenient access to the data in the XML document using property access operators and iterators. //do something with the <user> element. As you can see, it doesn't ever get much simpler than this: one call to simplexml_load_string to parse the xml document, and we can directly traverse the elements using foreach. Plus accessing the text content of the elements is also very easy: no need for a separate call to extract the text, just treat the element as a string. Note that if you do need more advanced ways to traverse the structure of the document and access the data, the SimpleXML library still goes a long way. You can even use XPath expressions, if you really need that. In the left top we have a form with fields for "Username" and "Password", and a "Create User" button. Hitting the button results in a PUT request to /userroledao/createUser to create a new user using the values in the "Username" and "Password" fields. Halfway the page below the user form there's a list showing the existing users. This is populated with the data from the response of a GET request to /userroledao/users. When a single user is selected in the existing users list a GET request is made to the /userroledao/roles service to create a list of all available roles. Another GET request is made to the /userroledao/userRoles service and the data from the response is used to set the state of the checkboxes in front of the role names, indicating which roles are assigned to the user. If such a checkbox is checked by user interaction, a PUT request is made to the /userroledao/assignRoleToUser service, which will assign the corresponding role to the currently selected user. If the checkbox gets unchecked through user interaction, a PUT request is made to the /userroledao/removeRoleFromUser service, which will unassign the corresponding role from the currently selected user. In the right top we have a form with a "Rolename" field and a "Create Role" button. Hitting the button results in a PUT request to /userroledao/createRole to create a new role with the specified role name. Halfway the page below the role form there's a list showing the existing roles. This is populated with the data from the response of a GET request to /userroledao/roles. When a single role is selected in the existing roles list a GET request is made to the /userroledao/users service to create a list of all available users. Another GET request is made to the /userroledao/userRoles service and the data from the response is used to check the appropriate checkboxes in front of the users names to indicate which users got the current role assigned. If such a checkbox is checked through user interaction, a PUT request is made to the /userroledao/assignUserToRole service to assign the currently selected role to the checked user. If such a checkbox gets unchecked due to user interaction, a PUT request is made to the /userroledao/removeUserFromRole service to unassign the currently selected role from the unchecked user. With a few (arguably non-essential) exceptions, this application covers all services of the UserRoleDaoResource. For reference I will now discuss the implementation details of this application. In fact, all of the actions that the user can initiate result in a POST request that refreshes the page, setting a specific value for the action field to select the appropriate backend action. In case of the user form, this results in a call to the PHP function create_user(), passing the values of the POST data fields user and password, which originate from the HTML user form. //create a user with specified name and password. The create_user function follows the basic pattern of the cURL calling sequence. The difference with the preceding generic example is that this is a PUT request, and thus the value for the CURLOPT_CUSTOMREQUEST option is 'PUT' rather than 'GET'. The /userroledao/createUser is specified to take a user-element in the request message body, which is used to convey the user name and password. This element is constructed as a XML document and passed to the message body using a curl_setopt call using the CURLOPT_POSTFIELDS option. Because we are passing a message body in the request, we also need to set the Content-Type header to application/xml to specify that the data passed in the message body is an XML document. Finally, after the call to curl_exec, we use a call to curl_getinfo() using the CURLINFO_HTTP_CODE constant to obtain the HTTP-status of the request. This should be 200 if the PUT request succeeds. If there is some problem with the request we should receive a code in the 400 range (if the request itself has some problem) or the the 500 range (in case the server is experiencing some problem that is not related to this particular request). For example, if the user already exists, one gets a 403 (Forbidden) status instead of 200. Note: The Pentaho REST services do not seem to have a robust way to convey the exact nature of the problem in case the request could not be met. At least, I have not noticed any useful information being conveyed in the response except for the HTTP status code. I checked the Administration perspective in the Pentaho user console to see what would happen in case an existing users is entered, and there the action just silently fails. It would be nice to get a recommendation about how to deal with error situations when using the Pentaho web service calls. The get_users() function is a simple GET request to /userroledao/users, followed by a parse of the XML response. Since both these aspects have been discussed already I will not repeat that code here. //if the current role appears in the array of assigned roles, check the checkbox. The get_user_roles($user) function calls returns an XML document containing <role>-elements representing the roles assigned to the specified users. We use the foreach loop to iterate them and we store their string values (i.e., the actual role names) in the array $assigned_roles. The remainder of the code is very similar to how the existing user list was rendered, except that we now use a call to get_roles() rather than get_users(). This does a GET request to /userroledao/roles and returns an XML document containing all available roles. We then iterate through that list to create an input-element of type checkbox along with the actual role name. The checkbox is checked according to whether the current role name is found in the previously populated $assigned_roles array. The changeUserRoleAssignment() function writes its associated role name (stored in its name property) in the role field of the form, and it uses its checked state to set the value of the action field to assign role to user or unassign role from user. It then submits the form. The PHP functions assign_role_to_user() and unassign_role_from_user() both perform a straightforward PUT request to the /userroledao/assignRoleToUser and /userroledao/removeRoleFromUser services respectively. For each these requests, the values of the user and role fields are passed to the service via the query string parameters userName and roleNames respectively. Note that these two services support multiple role names; however only one is passed at any time by our application. Should you wish to pass multiple role names, then you should separate rolenames by a tab-character (ascii character 0x09). Note that since the names are passed in the query string, they must be url-encoded. Although I haven't covered all implementation details, the rest is simply more of the same stuff. If you want to play with the code yourself, you can download the entire PHP script here. Could you help me please, or if you can, make a post with basic auth for third-party apps?? I would appreciate your help, best regards. Is there a way to get the current user logged in? I see in the reference that one can get all users, but I need the current user and don't see it. thanks for the kind words. It's a good question. The second part of this path is the user name. It might be possible to reconfigure pentaho so as to assign a different path for a user, in which case this workaround would break. But I am not aware how to go about such a reconfiguration, and I hope that this is a viable workaround for many environments. PS: maybe you can make a JIRA case with a feature request for this functionality? It seems like a logical and sensible request to me. This is pretty understandable to calling Pentaho Api using Curl, i need to call php script using jQuery ajax call to fetch data and display the response on dashboard, but when i do this, it gives me 404 error :( someone help me please??? "i need to call php script using jQuery ajax call"
This sounds rather generic - I don't see how it relates to my blog post. It was really helpful in getting started with Pentaho Rest APIs. Just to confirm is there any limitation with Rest APIs based on Pentaho editions (CE vs EE)? thanks for your interest in this topic! "Just to confirm is there any limitation with Rest APIs based on Pentaho editions (CE vs EE)?" Frankly, I am not aware of any limitations as such. Obviously, EE features that have REST/service counterparts are not available in CE, because those features are not in EE. But I do not believe the EE counterparts of services available in CE have more or better functionality. I am using this for administrating users on different servers (practically copying users/roles/permissions from one server to another) and it works great. I am trying to upload mondrian schema using curl and plugin/data-access/api/datasource/analysis/catalog/ api but it doesn't work as I always get "Method not allowed" error. Download works fine so I suppose I am using wrong parameters/headers or something. On the other hand, using the old plugin/data-access/api/mondrian/postAnalysis call works ok.
Did you maybe have a chance to try this? My idea is to have a complete "synchronization" between two servers, so users/roles/permissions, repository content, mondrian schemas and jdni connections synced in one script. > Did you maybe have a chance to try this? But maybe you can post it as a bug that you get Method not allowed? You might get some feedback that way on why it doesn't work. Just a note for anyone playing with user creation through the API - if you manage to somehow create an empty user (I did that while testing, accidentally of course), you cannot manage them through Pentaho console any more, as the whole "Manage Users" tab just disappears. To make things a little worse, you cannot delete this empty user through the API so you get pretty stucked (I didn't find a way to delete them since the users are saved in jackrabbit repository which is a "black hole" to me). Hi Roland, I am new to Pentaho and I would like to know whether I can use C as my programming language to create custom applications to interact with Pentaho data? @Anonymous, thank you for your interest. > I would like to know whether I can use C as my programming language to create custom applications to interact with Pentaho data? Well, Pentaho itself is a BI suite - it doesn't "have" data, it works with data. In some cases, Pentaho exposes data of source systems it is connected to using its own services, and you can consume these with any webclient. So, in theory the answer is yes. Whether it is practical for the kind of application you have in mind is something that you'll need to investigate. Perhaps the kind of application already exists, or important parts of the functionality you require may be provided by the pentaho platform. If that is the case, then you might be better of sticking to Java since that is the language used to create Pentaho. Thank you for your prompt reply. My first choice was Java but the project requirement is to expose Pentaho Job/ transformation as web service through web assembly. Can I reach you at gmail? sure, you can mail me at roland.bouman@gmail.com.